The Harvey Run Trail was established through a partnership of Chadds Ford Township and the Brandywine Conservancy & Museum of Art. This trailhead provides users access to a 5-mile natural surface trail network stretching through 300 acres of preserved open space. The trails are open daily from sunrise to sunset. Barbecues, cookouts, grilling and open fires are prohibited. Pet owners, please leash your pet at all times and clean up after them. Alcoholic beverages and use of drugs are strictly prohibited. Please do not litter. Trash and recycling must be taken home. Vandalism is prohibited and vandals will be prosecuted. Please be courteous to others and limit disturbance to wildlife. The Harvey Run Trail is open only for walking, no bicycles, motorized vehicles or horses. 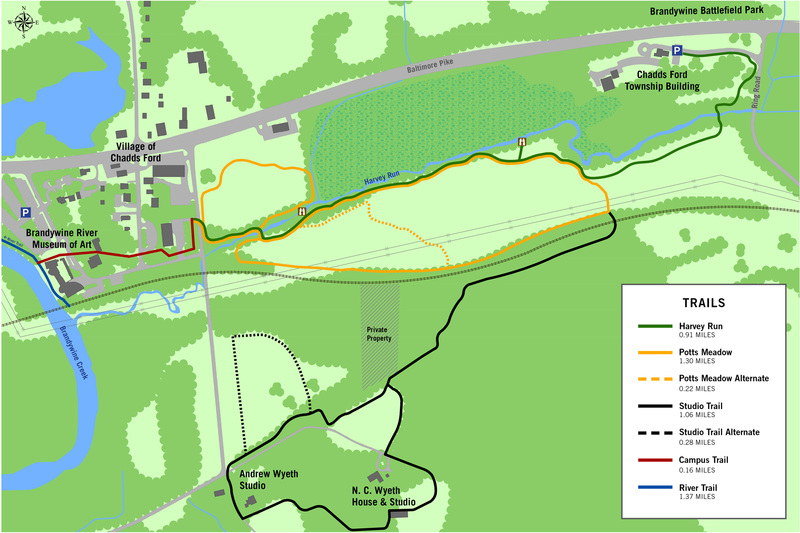 The Harvey Run Trail was financed in part by The Commonwealth of Pennsylvania, Commonwealth Financing Authority, The Brandywine Conservancy & Museum of Art, and Chadds Ford Township.